Or gold sparkle if you don’t want silver. 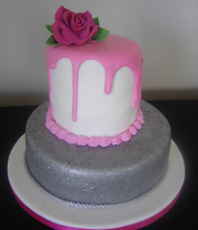 The pink on the cake can be changed to a colour of your choice. Usually $270 for cake sizes 5+5+9 inch to serve 50 guests. Or larger size 6+6+10 inch serves 60 guests Usually $320.00. These prices are for orders placed in the month of Aug 2017. Your cake order can be created for later in the year for when you need it, but you must place the order in Aug 2017 to get the discount special. 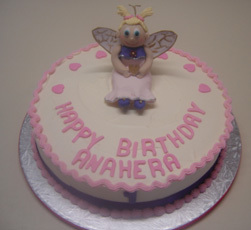 Fairy cake has buttercream icing and a hand made icing fairy. – All colours and hair style can be changed to look like your special wee girl. – Name and age of the birthday girl also in colours of your choice. – Or if you have a special birthday boy I can do an icing boy instead. 10 inch was $120.00 SLASHED DOWN to $100.00 serves about 32 guests. 9 inch was $110.00 SLASHED DOWN to $90.00 serves about 25 guests. 8 inch was $100.00 SLASHED DOWN to $80.00 serves about 20 guests. These prices are for orders placed in the month of Aug 2017. 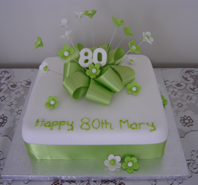 Your cake order can be created for later in the year, for when you need it. You must place the order in Aug 2017 to get the discount special. Usually $75.00 for size 8 inch to serve 27 guests. Or a larger cake size 10 inch to serve 45 guests. Colours, wording and numbers can be changed to suit what you require. These prices are for orders placed in the month of August 2016. Usually $75.00 for an icing bride and groom. The special is for one icing bride and one icing groom. No cake included. If wanting little icing children as well just let me know and I can give you a quote. The bride and groom can be personalised to suit your colours and clothing. 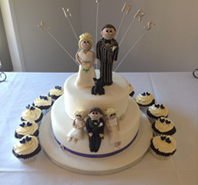 The bride and groom are made out of fondant icing. If your wedding is in the summer months I can make them up fresh for your wedding date. As long as you place your order in June you will get them at the discounted rate. These decorations also keep well if stored in a dry area, away from moisture and away from sunlight. These prices are for orders placed in the month of Aug 2016.